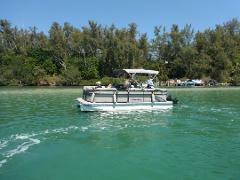 24' Pontoon will accommodate up to 16 people comfortably. It has a bimini for shade, radio for music, gps for navigation, boarding ladder for swimming and an anchor for sandbar hopping. 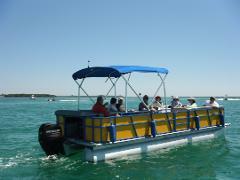 These pontoons will accommodate up to 10 people comfortably. They have a bimini for shade, radio for music, gps for navigation, boarding ladder for swimming and an anchor for sandbar hopping. Enjoy 6 hours on the water exploring local sandbars and sights aboard our fully equipped pontoon boat with a bimini shade. Enjoy 6 hours on the water exploring local sandbars and sights aboard our 20' fully equipped pontoon boat with a bimini shade.